Texting and Driving is illegal in Colorado – more importantly it can hurt or even kill someone. The DCSO remains committed to the safe and efficient movement of traffic on the county’s highways. 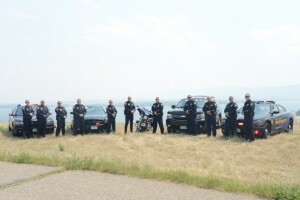 We operate a Traffic Unit, which includes a motorcycle team. The Traffic Unit uses a Strategic and Tactical Analysis of Crime and Crashes (STACC) to help ensure the safety of the motoring public in Douglas County. Deputies in the unit perform STACC enforcement on a daily basis, concentrating their efforts in areas that are notorious for crashes and dangerous drivers. Traffic enforcement deputies assist with all traffic related matters, thus freeing up road patrol officers and allowing them to apply their time to more immediate patrol duties. All traffic deputies have specialized training in Accident Investigation and Reconstruction, utilizing state of the art crash scene mapping technology and computer aided drawing systems. Traffic deputies also conduct DUI enforcement, aggressive driving enforcement, and school zone enforcement. The Traffic Unit uses the latest in radar and laser speed detection technology, mobile camera equipment, and mobile computers. These tools help officers gather evidence for prosecution of traffic violations.